One of the biggest difficulties with planning an outdoor event in advance is you're never sure what the weather forecast holds in store. Of course, you can check the library's copy of the Farmer's Almanac for a general idea, but odds are your experience with the weather involves a lot of prayer and a series of heavy sighs. Staking or weighting a tent on asphalt? Drive stakes into the asphalt. Secure the tent with concrete weights. 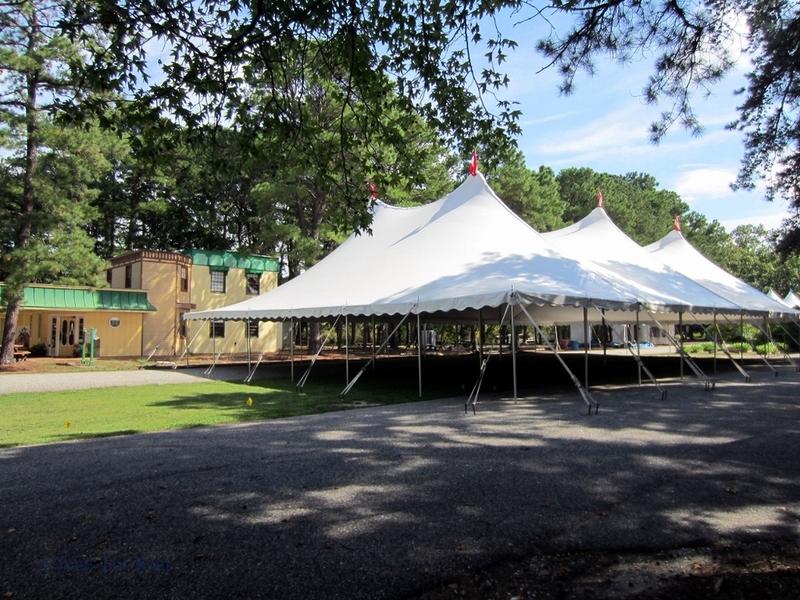 Tented events and corporate event rentals are our specialties at Tents For Rent. We believe every time of the year has opportunities to celebrate and show appreciation -- especially for employees -- at companies of all sizes. Outdoor events can be the perfect way to do this and with summer right around the corner, the time to start planning was yesterday. The patio was a rooftop and thus needed to remain waterproof. The patio was right in front of the announcer's stand. So, it needed to be very low profile. The roof was not strong enough to support the weights required to secure the tent. The patio had two levels. Each of these challenges alone would have been difficult to solve. 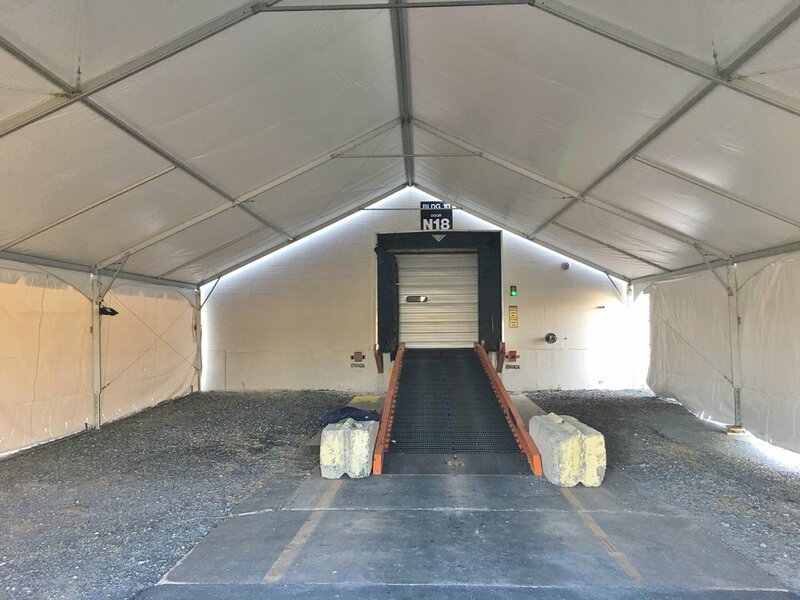 After surveying the location and extensive discussion on what would be the best solution, we worked with Anchor Industries to design a custom tent that all sloped in one direction. 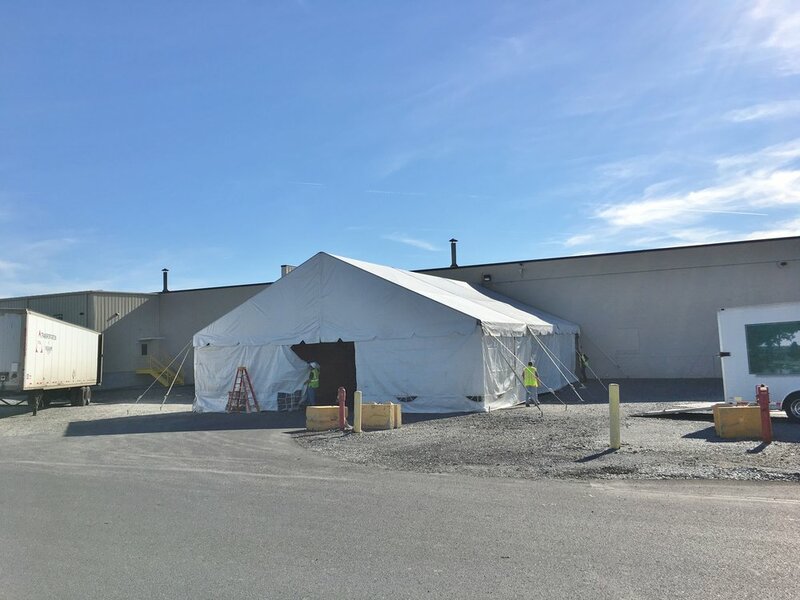 This created a solution that gave Mohegan sun the needed space until their new facility was completed. 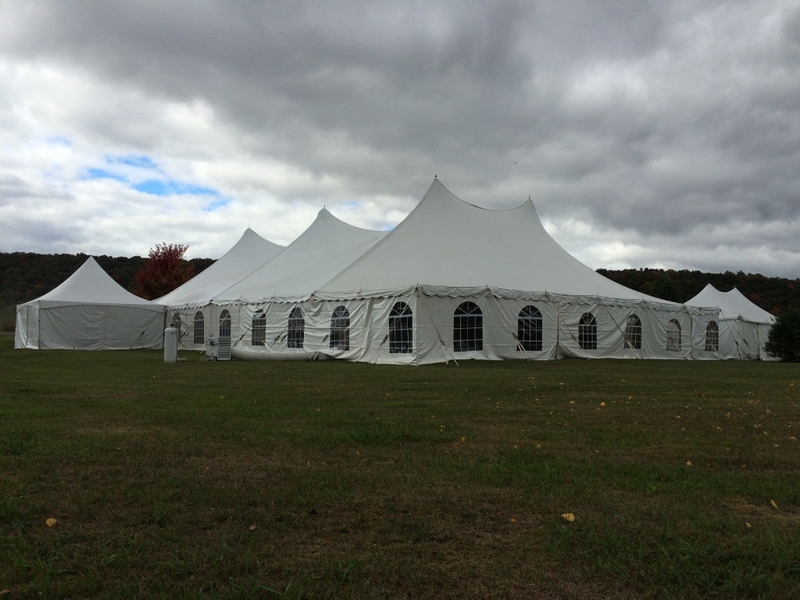 The tent was complete with lighting, heating and all the necessary amenities for a great outdoor event...rain or shine. 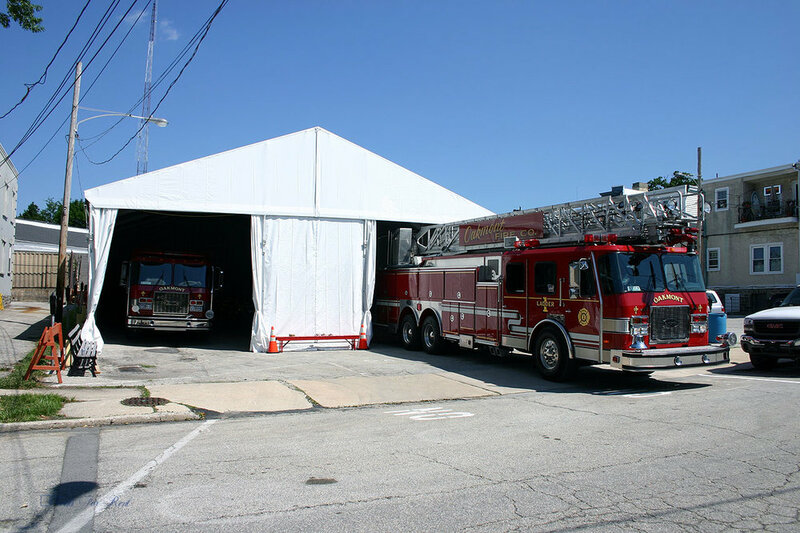 Do you have a difficult tenting challenge? Contact us today. We'd love to help. Call us at 717.733.9700 or request a quote to be prepared for any type of weather. 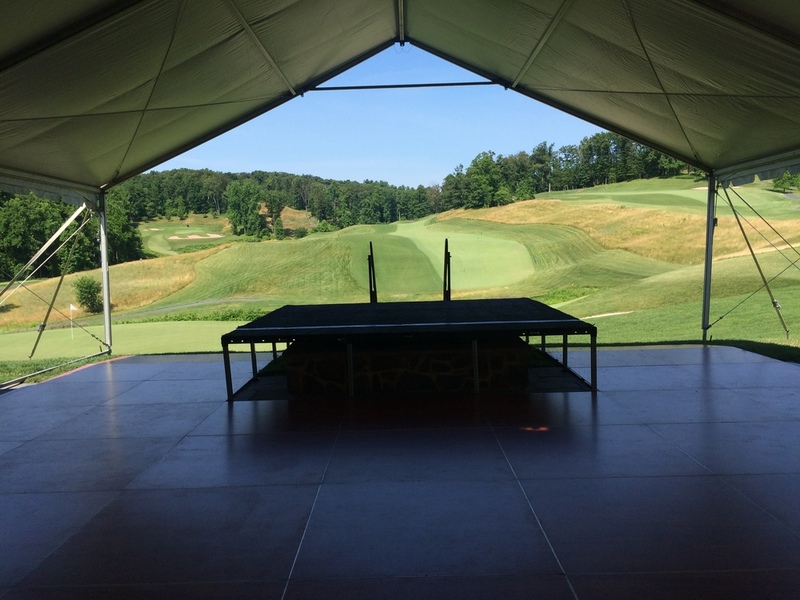 Many people planning an outdoor event or wedding really love the outdoors. So do we. If you're an outdoors loving person, maybe you prefer to have your event outdoors with no tent at all. Maybe you like the full expanse of blue sky overhead during your wedding ceremony. Maybe you have visions of soft moonlight during your reception. Maybe you want to look up at the green canopy of trees overhead. Rain isn't the only type of inclement weather. Shade from the hot sun can help keep your guests more comfortable too. Even if you have your wedding ceremony outdoors, it's a great idea to rent a tent for the reception to cover the food, sound system and etc. If you're planning to light the tent, plan for how you want to light the space if you don't rent a tent. Not all types of lighting work as well outside a tent. You may want to rearrange your seating layout if you don't rent a tent. If in doubt, rent a tent. It's much better to rent a tent and not need it than cancel the tent and wish you had it. So, how does it all work? When you reserve, we require a 25% deposit. This guarantees that your tent will be available in case of inclement weather. However, you may cancel the tent if the weather forecast looks beautiful. You may make this decision up until 9:00 AM of the day before delivery and save yourself the remaining 75%. 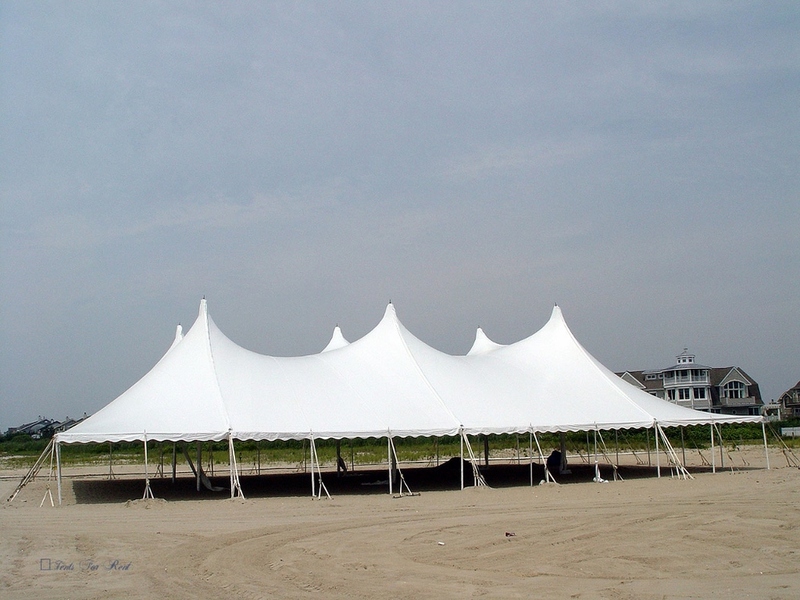 If you cancel after 9:00 AM, you save 50% of the tent rental cost.There are two exceptions to this: linens need to be cancelled one day earlier than tents in order to get a 75% refund and permits are not refundable at all. 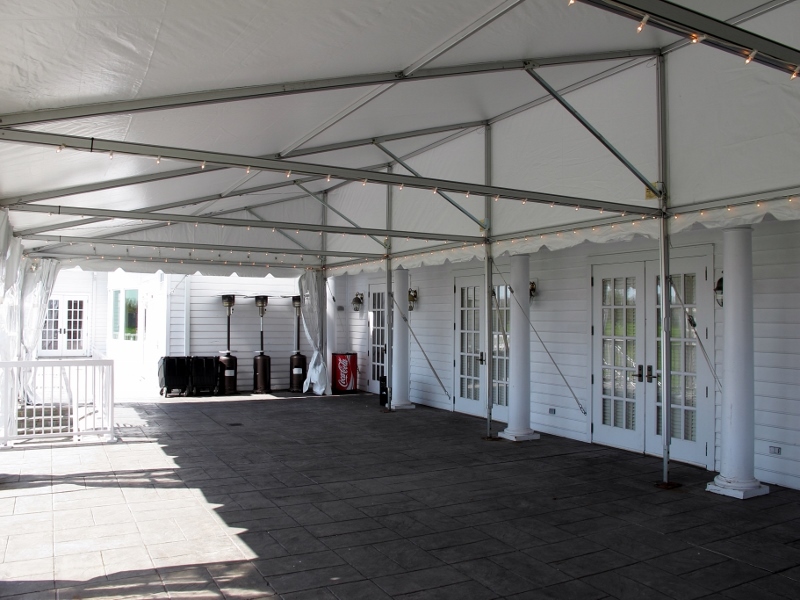 This gives you peace of mind knowing that your guests will have shade from the hot sun or cover from the rain. Yet, you have the option to enjoy the beautiful outdoors. So, reserve today to plan an event that will be beautiful no matter what the weather. 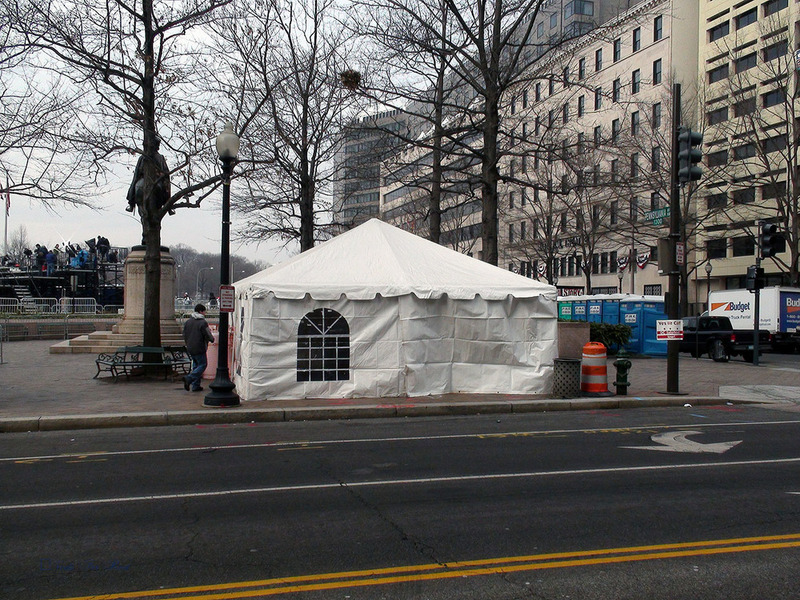 We are hard at work installing tent for medical aid stations at the 2009 Presidential Inauguration parade. 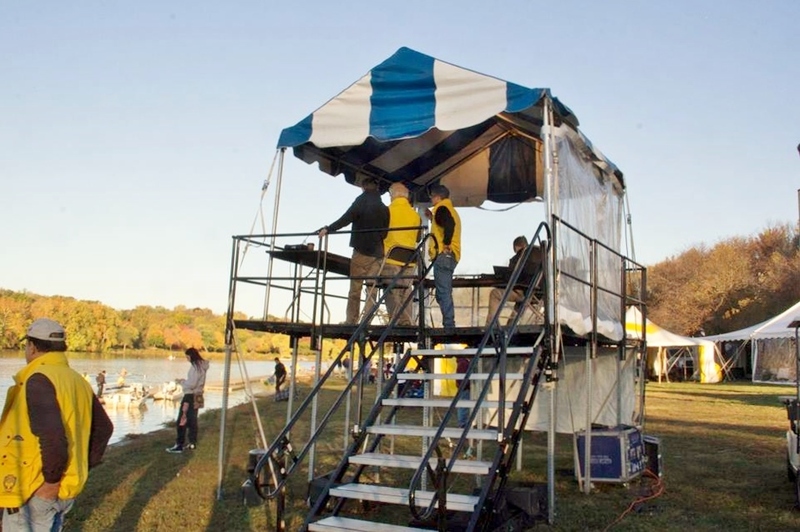 We are providing tents secured by weights, tables, chairs, lighting, generators, and heaters.